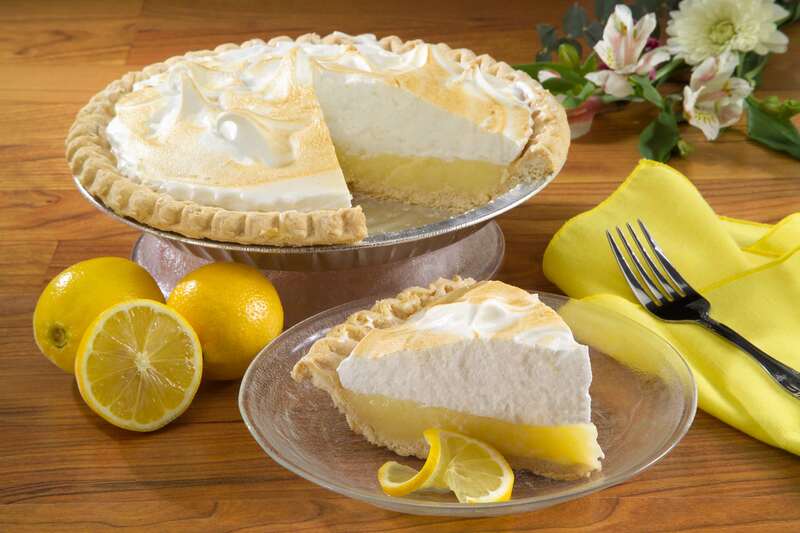 Light, fluffy and lemony…those three words sum up this delicious lemon pie. Pies are a welcome sweet treat for any occasion and with us, they’re super easy to make at home. So bake your own piecrust in 3 steps, whip up the filling and bake. That’s it, you’re all set to go! Mix the flour, salt and sugar in a bowl and stir nicely to let a lot of air in. Now crumble the unsalted butter with your hands or using a pastry blender into this mixture. Keep combining until all the butter is incorporated into the mixture and it becomes smooth. Add 4 – 5 tablespoons of ice-cold water to make soft yet holding dough. Tip: The dough shouldn’t be too tight. Now roll out the dough on a flour dusted surface using a rolling pin. Lightly grease a pie tin with butter. Lift the rolled out dough with the rolling pin and then cover the pie tin with it. Press it from the sides to attach to the curves of the tin and discard any dough that overflows from the sides. Cover this pie tin with the dough with a plastic wrap and refrigerate for at least 30 minutes. Preheat the oven to 450 degrees F or 230 degrees C. Meanwhile, bring sugar and water to a boil in a saucepan over medium heat. Now add the lemon slices to this mixture and let them simmer for 1 – 2 minutes or until they become tender. Remove the saucepan from heat and keep aside to cool. Remove the piecrust from the refrigerator and let it stand for 5 – 10 minutes to come to room temperature. Then place it in the preheated oven to bake for 8 – 10 minutes or until the crust turns light brown in color. Remove from the oven and allow it to cool to room temperature. Reduce the oven heat to 425 degrees F or 220 degrees C.
Combine the butter and sugar in a bowl using an electric mixer until they become fluffy. Separate the egg yolks from the white and add them to the butter mixture. Note: Don’t discard the egg whites, they will be used later. Also add the salt, lemon juice, lemon peel and flour and beat everything until smooth. Now add the milk and beat gently. The consistency of the mixture will be thin and it might appear curdled. That is fine. Now beat the egg whites separately until stiff peaks form. Add this to the previously prepared batter. Transfer the batter to the baked piecrust. Bake for 10 minutes and then reduce the heat to 350 degrees F or 175 degrees C. Bake for 20 minutes more. Finally remove from oven and allow the pie to cool down a bit. Garnish with whipped cream and icing brown sugar. If desired refrigerate until serving. While serving cut into pieces and serve!